Swift Urgent Clinic offers the region’s only “In-Motion” MRI scanner known as the Esaote G-scan Brio and the Extremity O-Scan MRI. The Swift Orthopedic Urgent Clinic is affiliated with the Inmotion Diagnostics spine and musculoskeletal imaging platform. The InMotion MRI allows us to image you in both the supine (flat on your back) position and the standing position. The MRI table actually rotates from the horizontal position to a vertical position which allows pictures to be taken while the neck and low back are in a weight bearing state. This potentially demonstrates a disc herniation or “pinched” nerve that might otherwise not be seen with the usual MRI performed only in the lying down position. The musculoskeletal and extremity MRI is called the Esaote O-Scan MRI. All Esaote MRI systems have patient comfort at heart and the O-Scan is no exception. O-Scan is the ultimate solution for MRI of the knee, calf, ankle, foot, hand, wrist, forearm and elbow because of the patient experience and high quality imaging. Does your back or neck hurt when you are standing or laying down? If you are like most people who experience pain while standing, weight bearing MRI is for you! In addition, this MRI is open and not like the typical donut-shaped tube. This advanced open architecture MRI scanner can also image many different joints (e.g. hips, knees, shoulders, elbows, wrists and ankles) while also allowing for significant flexibility in positioning of the patient thereby maximizing comfort without sacrificing quality. Imaging services performed at Swift Urgent Clinic are read by a board-certified diagnostic radiologist. The clinic includes advanced trained radiology technicians led by a board-certified and fellowship-trained interventional and diagnostic radiologist. Many symptoms of pain and discomfort occur or worsen when the human body stands. A conventional MRI in which the person is lying down only may not show the disease or condition causing the particular symptoms. 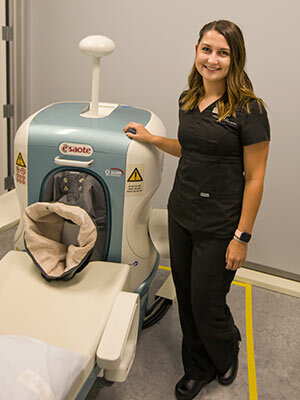 An advantage of the G-scan Brio is that the standing and tilting MRI provides additional views needed by doctors to accurately diagnose musculoskeletal conditions. The tiltable Esaote G-Force Brio provides more detail, better accuracy and greater confidence . With the G-scan Brio you can gain a more complete understanding of the joint under examination. The forces of gravity generate bio-mechanical changes in the human anatomy, so MR imaging in the natural standing position allows you to obtain extra details which would not normally be seen.